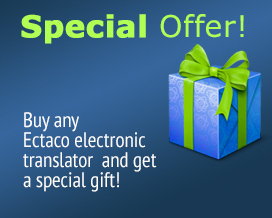 The ECTACO Partner Dictionary and Travel Audio PhraseBook EBe800 is a powerful bilingual travel companion. One of the most impressive language management handhelds available anywhere, it is the clear leader in the field of portable translation devices. With its state-of-the-art voice capabilities and sleek modern design featuring a hi-res color touch-screen, it is our most popular model. This one-of-a-kind device includes a sophisticated speaker independent speech recognition system that lets it understand what is said to it in English with crystal-clear, professionally narrated native-speaker voice output for both English and Bengali in the PhraseBook.